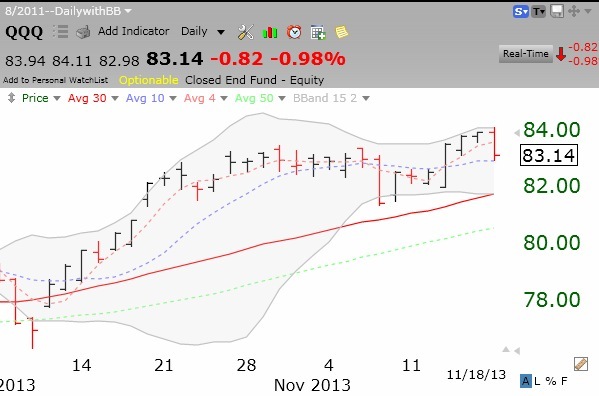 QQQ fails to break above top Bollinger Band (15,2) and bounces down. I look for support at the lower band, around 81.77. I find that the 15 day 2 standard deviation Bollinger Bands are very useful for identifying short term support and resistance levels for the index ETF’s. Just look at the daily chart below to see how prices stay within the bands. A move outside the bottom band is often a sign that the index will reverse up. However, if the lower band is broken and starts to turn down, it often tells me that a larger decline is imminent. While not perfect, the BB’s give me an edge when interpreted in the context of other confirming indicators. You can plot Bollinger Bands yourself on most stock charting programs. Freestockcharts.com is a simpler, free version of TC2000 (the subscription software I use). Isn’t the GMI 6/6, or have you recently changed it? Thanks, Rick, for alerting me to my typo!